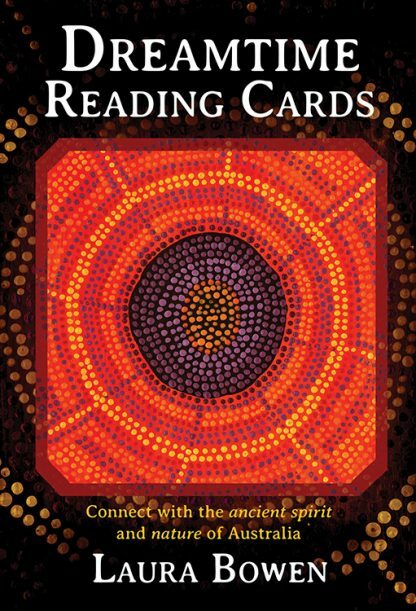 Drawing on the ancient wisdom and spirit of Aboriginal Australia, Laura Bowen has created the Dreamtime Reading Cards using indigenous dot painting techniques. These beautiful cards are powerful meditations, showing you the world with a new pair of eyes and allowing you to connect with spirit. The 36 cards feature the flora and fauna and sacred spaces of land, water and sky that reflects those that surrounds us, exists below us and lives above us. Each card contains spiritual meaning and personal messages and the accompanying book offers a detailed explanation to guide you in your understanding. Back in the beginning, in the Dreamtime when the earth was being created, there was spirit. Some of these spirits became a part of the landscape, some took on the shape of the Australian continent�s abundant flora and fauna, and some became man and woman � and it is from them that we are all descended.